I have been scoring the most awesome polishes lately. 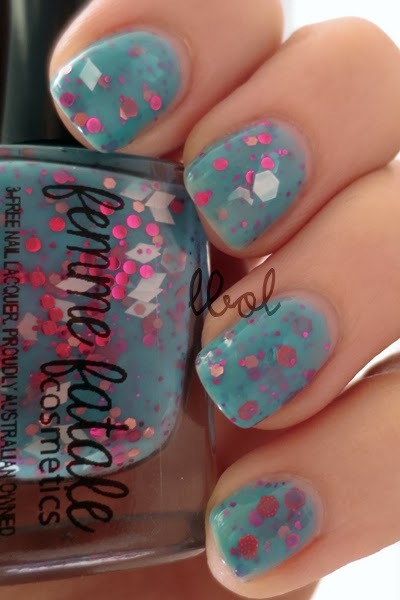 I've been smitten with Winter Hyacinth for a while now... magenta holo and circle, salmon pink and white matte glitter (kite shaped too even!) in a translucent turquoise base? Duh, I say! This is three coats (plus a little bit of dabbing here and there) with one coat of Essie - G2G in artificial light. The first coat was super sheer and glitter coverage was "meh," but it wasn't frustrating building up to opaque and it only took a little glitter fishing (especially for the white kites) to evenly disperse the good-goods. Side note: I hate the hardest time getting a good (decent) stupid picture on this day. I don't know what the deal was. Like, some days the lighting is just fine and my skin doesn't look freakish (I'm quite pale, really. The German genes won over the Italian ones, I guess) and other days it, you know, does look freakish. Like, silly putty looking. I don't even know.